Matte and I went first. Jeff took some test shots to see if what he was getting enough of the castle in and such. Once the framing was right, Matte and I took our places. But Matte wasn’t facing the camera. He was facing me. He took both my hands in his and started saying something. Although I don’t remember the actual words, I recall they were very romantic and sweet and I started to cry as soon as he began speaking. He then got down on one knee, pulled out a box, opened it, and asked me to marry him. People all around us and across the water, near the castle witnessed the whole thing and immediately began to applaud when they knew my reply. 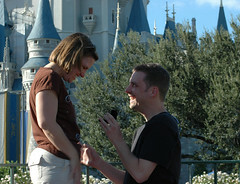 Jeff captured the entire proposal on Matte’s camera, and Jenni shot video. After all the hugging and congratulations, Matte said we needed to go to City Hall. There, we were given a set of Mickey and Minnie ears. His, a top hat, and mine, covered in white sequins with a veil attached. Each of us also received a “Congratulations!” button and one with Minnie and Mickey as bride and groom. We put them all on, to wear proudly through the park. Jeff kept shooting, and the cast member behind the counter captured it on Jenni’s video camera. Matte’s family was unaware that all this was happening as they roamed around the park. Just as we were settling in to dinner at Tony’s Town Square on Main Street, the manager presented Matte’s mom with a box. When she opened it, she found a Lady & The Tramp dog bowl with something written inside. It said, “Matte & Cathy” surrounded by a heart, and “She said Yes.” There were more tears and hugs as I was welcomed into their family. It was the most supercalifragilisticexpialidocious day! Congratulations, Cathy & Matte! I’m crying tears of joy right now. Were you wearing the “Happily Ever After” top that Beth gave you?? How PERFECT is that?!!! Congrats you two!! Jenni had told me about this before she left for Florida and I was SO excited! Matte is great and, knowing what a special friend you have been to my daughter over the past several years, you are so deserving of a great guy – happy that you found one! Best of everything to both of you! I’m so glad we could be there to capture the moment for you two! I love the way they told Matte’s mom at Tony’s! Too cool. You truly do deserve your Happily Ever After, and I think Matte is just the person to share it with. I hope you guys enjoy the rest of your vacation at WDW. Give my best to Matte and his family! Congrats, I got to your blog via jenni’s. That is so romantic and such a great place to be in when you are getting engaged. I LOVE this post!! Congratulations, Catheroo! What a Romantic proposal! And, Lady and the Tramp is My Favorite Movie! And I just adore Disney World! CONGRATS! Wow, you found a keeper for sure!! I am so happy for you Cathy you deserve that Happily Ever After!! That is so awesome – it’s a zippity do dah day at the happiest place on earth! CONGRATULATIONS – you deserve it! So very cool! Congrats to both of you! Are they kitties excited? Wow! I am so very happy for you! Congratulations and wishes for a wonderful life together. I am SO HAPPY for you both! You are such a cute couple and, Cathy, I know this is something you’ve always wanted and I think Matte’s definitely the man for you. See…it was worth the wait! Someday your prince will come. Wow! How very cool! I agree that Matte choosing WDW as his proposal spot definitely strengthens his “the one” status! I miss you! I hope to see you soon. Congratulations, Cathy! You deserve this special man in your life. Matte you are a great match for Cathy. You two will have a magical for sure. That’s just great! CL – I’m so happy for you! You deserve the best and more. I look forward to meeting Matte. CONGRATULATIONS Cathy and Matte! Cathy, I couldn’t be any happier for you. What a romantic story. Congratulations, Cathy and Matte. How romantic and magical can this be? May you two live happily ever after. OMG, that is SO COOL! I’m so happy for you both…definitely a story that will continue to inspire your entire family for years to come. I’ll never think of Disney World in quite the same way again. What a thrill for us all! SURE HAPPY FOR YOU! Does this mean we get to go (or come) to California! GLAD SCOTT FORWARDED THIS – WE ARE NOT O YOUR LIST! Looks forward to Christmas and seeing you! LOVE, The Jefferson Reiatives! ohmygosh. You guys win the “too cute” award!! Can’t wait to hear more…..Congratulations!! Since I STILL haven’t talked to you personally, I have to do this through the blog…JEEZ!